This weekend, I'm appearing at one of the most enjoyable and hospitable events on the UK convention circuit - the 2D Festival in Derry. 2D, the Northern Ireland Comics Festival is an annual event that celebrates comic book culture and works to promote and support sequential art and storytelling. The festival is organised and supported by the Verbal Arts Centre, a unique and celebrated educational charity founded to promote the spoken and written word in Ireland. It's been going from strength to strength since 2007, and due to record attendances has this year expanded into a two-day event. 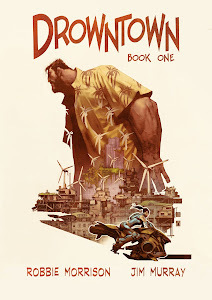 I'll be there on Saturday 1st and Sunday 2nd of June, and, as a sort of 'convention exclusive', will have a small number of advance copies of Drowntown with me. The book isn't officially released until June 20th, so come along for a sneak peek and let me know what you think.